Whether in container construction, as facade area or railings: Only few materials find such varied use like stainless steel and require at the same time so much craftsmanship. 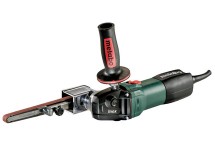 When smoothing weld seams, removing tarnishing, processing of surfaces or edges and high-gloss polishing, highest precision and machines perfectly adapted to the material are very important. 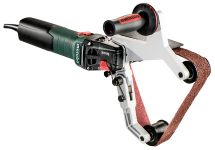 For stainless steel surface processing there is no universal tool, since surfaces, pipes, profiles corners and edges have different demands for the power tools. 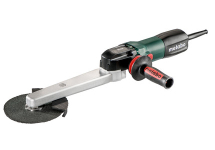 Therefore, Metabo offers the right tool for any task with a wide Inox range and also perfectly matched accessories - from Inox angle grinders to fillet weld grinder, burnishing machines and tube belt sander to band files and angle polisher. 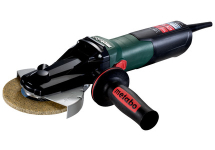 Using the Metabo power tools for stainless steel processing you will carry out any task at the hightest level from rough grinding to satin-finish and mirror polishing. 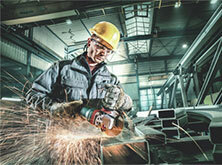 Special attention has to be paid to the accessories used for the most demanding material, stainless steel. 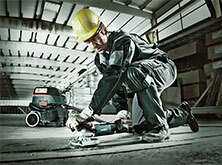 Metabo has an extensive range of accessories matched especially to the processing of stainless steel. 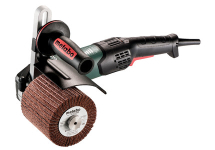 Fleece sanding pad and flap disc for the Inox angle grinders, sanding belts in different versions and grits for the tube belt sanders and band files, grinding wheels and rollers for the burnishing machine and many other accessories for processing stainless steel get the best out of the Inox machines and ensure shiny results when working.